The National People's Congress (NPC) Standing Committee on Friday held a special inquiry into a report on government medical service spending. The report, submitted by the State Council, said China's fiscal spending on medical services in 2017 was 1.4 trillion yuan (about 204 billion U.S. dollars), a 55.5 percent increase from 2013. During the inquiry attended by Chairman of the NPC Standing Committee Li Zhanshu, legislators asked questions on how the 1.4 trillion yuan had been spent, measures to deepen reform of the medicine and healthcare system, providing easier access to medical services, public hospital reform, combatting medical insurance fund fraud, providing better medical services for the impoverished, tightening supervision over the vaccine industry, and the development of traditional Chinese medicine. 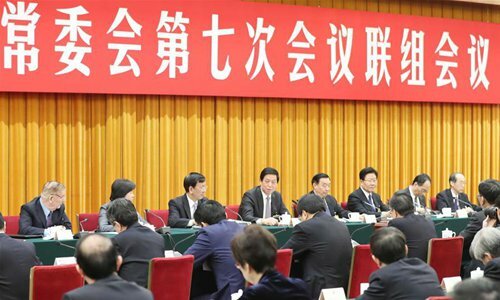 Vice Premier Sun Chunlan, and officials from the Ministry of Finance, the National Health Commission, the National Development and Reform Commission, the National Healthcare Security Administration and the National Administration of Traditional Chinese Medicine answered the questions. To better implement the Healthy China initiative and deepen reform of the medicine and healthcare system, a problem-oriented and performance-based approach must be adopted to improve the efficiency of using medical funds, Li said. He asked the NPC Standing Committee to draw experiences from its supervision of public funds and improve procedures. The NPC Standing Committee also called for the stepping up of examination and supervision of the government's budget and expenditure policies, and promote budget performance management. Sun said expanding government spending on medical services had provided guarantees on reform, adding that coordinated reform on medical services, medical insurance and medicine would continue to ensure that everyone has access to basic medical and healthcare services.